Declan Devine will announce his Derry City skipper for 2019 at the Past, Present and Future event at Magee tonight. DERRY CITY manager, Declan Devine will unnveil his captain for the 2019 campaign at tonight’s Past, Present and Future event at University of Ulster Magee. The even marks the start of the club's 90th anniversary celebrations and will acknowledge the 30th anniversary of Derry City's historic 'treble'. 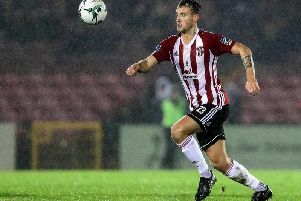 And Devine wants to use the occasion to announce his skipper for his new-look Candy Stripes squad which kicks-off its season with a home fixture against league newcomers, UCD next in just seven days time. “I’ve already spoken to the person who we are going to announce,” revealed Devine. “I’ll name a couple of vice captains as well. I’d expect that changing room to manage itself this year. There is no body here for an easy ride, we are all working as a team. “The boys we’ve brought to the club are good people and are hungry for success and want to show people they are Derry City footballers. To get this club back where it belongs it needs everyone pulling in the right direction." The club also plans to dedicate each home game this season to a ‘2019 Wall of Fame’ winner where one person or player who has contributed to the club’s success will be honoured. The first of these presentations will be made tonight. The event is free, however those wishing to attend should email emma@derrycityfc.net to reserve their place.